We got a bottle of wine and some snacks on the house, which was very nice! Generally decent room. Staff seemed to be working hard to please. Welcome drink was nice. really nice staff, great location, and absolutely worth the price. really enjoyed the staying, thank you! I likes nothing at this hotel. The information you booking.com gave me as your costumer was total wrong:((( It is difficult to trust booking.com’s information. I never knew this hotel existed and never once visited. I somehow got a reservation and was told that I did, I explained to the rep ( who could not understand) and just ended up hanging up. Once again, I hope I was not charged and was very turned off by the rudness of the employees. Front desk service; early check in; 1 hour extension on check out; spa & pool; breakfast buffet and lovely dining room. Walking distance to the light rail & to Cinema City. The room was small but comfortable, with a cute porch and fabulous view. It was clean and well kept. Rooms at Crowne Plaza Jerusalem are spacious and well equipped, with a mini-bar, electric kettle, and a TV with cable channels. Parking is available and guests will also find a modern spa, a gym, a swimming pool and 2 restaurants serving Israeli specialties. The Knesset, Israel's house of parliament, is 2,950 feet from the Jerusalem Crowne Plaza, while the Israel Museum is 15 minutes away on foot. When would you like to stay at Crowne Plaza Jerusalem? This air-conditioned room comes equipped with free Wi-Fi, a cable TV and electric teakettle. A minibar, safe and balcony are also included. On floors 3 to 7. Private parking is available on site (reservation is not possible) and costs ILS 50 per day. House Rules Crowne Plaza Jerusalem takes special requests – add in the next step! Crowne Plaza Jerusalem accepts these cards and reserves the right to temporarily hold an amount prior to arrival. Bed-type preference and smoking or nonsmoking preference cannot be guaranteed and will be assigned on arrival. Please note that on Saturdays and Jewish holidays, check-in is only possible after 20:00. The property will be undergoing renovations from Sun, Feb 24, 2019 until Fri, May 31, 2019. During this period, guests may experience some noise or light disturbances, and some hotel facilities and services may not be available. Please inform Crowne Plaza Jerusalem of your expected arrival time in advance. You can use the Special Requests box when booking, or contact the property directly using the contact details in your confirmation. Dirty room, trash in garbage can, mold on shower curtain, no room service menu in the room, reception staff are not helpful or knowledgeable. Paid way too much for the value! The condition of the room was horrible. As I entered to the room there was this strange smell like rotten egg. There was also mold in several area. I asked for a change of a room but somehow nobody seemed to have any interest to take care of the issue. For three night of stay I almost paid 1000 US$ and getting that kind of a service and room. I felt also misled from the booking.com site that the picture and the description of the room was not absolute not right or so off from the reality. Never again ... !!! Nothing ... maybe the location. The hotel is nice but under serious renovations, which I guess is a good thing. I hope to go back once the renovations are over in a few months. Hotel is outdated, under renovations, therefore noisy all day. Breakfast was not worth the money (23€ p/p). Noise Noise Noise. They are cleaning rooms me opening and closing doors multiple times at 9:00 at night. Dirty carpets. 80’or 90 Shekle for. Mediocre Saturday night dinner. Not much. It’s pretty much a rip at every turn. Great facility, large room, great location. 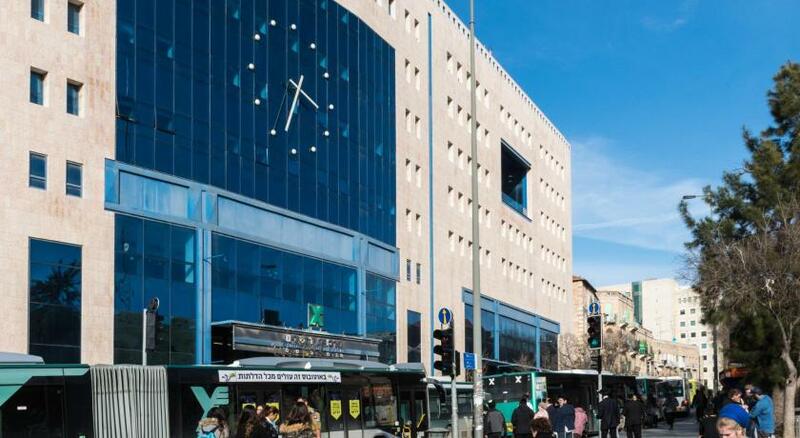 Location is great, right next to the Jerusalem International Convention Center, within walking distance from the bus station and the tram and quite close to Machne Yehuda. Stayed for one night only. The beds were comfortable. Enjoyed the silence in the hallways. Got the balcony view I requested. Called for a room service - arrived in a matter of less than 10 minutes. The customer service from Benny was much appreciated. He went above and beyond to make our stay enjoyable !! The receptionist at night could have been friendlier. The drilling at 8am.